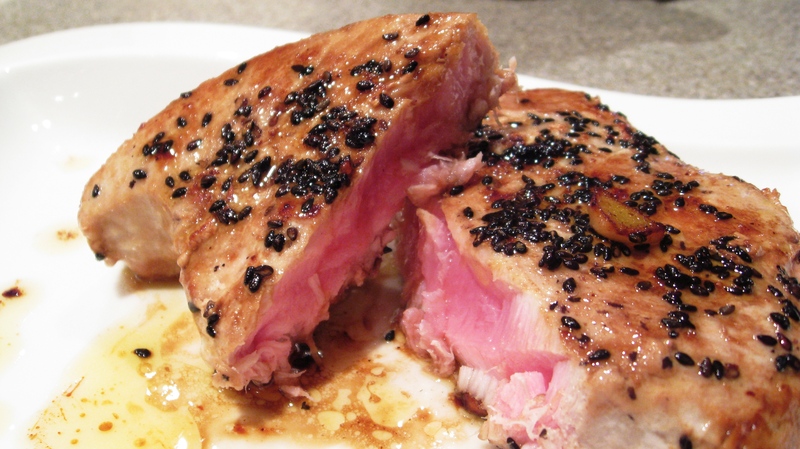 Ahi Tuna should be wonderful light or dark pink with as few white visible fibers as possible running through. We prefer buying sushi grade and about an inch thick. We wanted to share a quick, healthy and very light dish with you as a great mid-week alternative. I made three steaks tonight for the both of us (one smaller :-)) and paired it with our Persian Cucumber Salad. Here’s how to prep: This dish should take you no more than 10 minutes to prepare and cook. Sprinkle steaks with 1/2 tablespoon of black sesame seeds and push onto steak tightly. Place steaks seeds down into pan. Heat 1/2 tbsp butter and ginger in a cast iron skillet on medium high, add 1 tablespoon of rice vinegar and place steaks into skillet. Cook for 2 minutes on a little over a medium heat and add the other 1/2 tbsp of butter plus one more tablespoon of vinegar. Flip steaks and add 1/2 tablespoon of sesame seeds, pat firmly and spoon butter and rice mixture onto fish. Cook for one more minute and serve. Yummy and it’s healthy too! Great looking recipe I have some Ahi Tuna in the freezer, I will have to give it a try, I’ve been looking through your site. You have some great recipes I was wondering if you would be so kind as to share some of them on Think of it as Foodgawker or TasteSpotting for primal recipes. I’ve just started the site and I’m looking for people to help populate the site with recipes, would love to have some of your recipes on the site. Great site again. PS: do you have any special ones in mind that you’d like me to share?